Martin, can you tell me how you started working for Eduard? Probably as with many people here at Eduard,it all started with scalekit modeling. As a littleboy, I began to build airliner kits from Plasticard. I remember my first kit was a Tu-154. It really got me very excited, and later I began to draw aircraft on literally every piece of paper I could find. In 1998 I began to draw for magazines. These were classic drawings, and color sideprofile views. My „home base“ was the REVI magazine, but I’ve also done some work for L+K, 4+, Air Magazine and others. And right there, the very basis of my futurework in 3D was born. Originally I created drawings in 2D only, but because these were quite extensive and laborious, I simplified my workthrough 3D. I proved to myself that it’s much easier to create detailed and accurate 3D models, and then create the needed views from that, than to draw the views individually. You can then see all the lines from the correct angle. Eventually, I made a living from 3D modeling.It wasn’t just through drawings alone though. I found it necessary to offer much more.Diversifying was extremely challenging too. Of course, this boosted my skills with 3D modeling to a more solid level. Sometime around 2010, I tried contacting Eduard, and the result was my employment within the Brassin department, which was being estabilished during that time. Here, I began to work as a 3D designer. Where can our customers see your designs? For example, the cockpit of the Limited Edition1/48 P-38. Our Brassin accessories added a significant value to the Academy sprues,plus also the cockpits for our own1/48 Bf 109E and Spitfire kits. Also the 1/32DB601 engine for ourBf 109E and MG 17 mount for the same kit, were designed by me, to name a few. Amongst the latest ones is, with the aid of external co-workers, the cockpit for the new quarterscale Bf 109G-6. 3D designing within ourBrassin department isn’t the only thing on your daily schedule. It isn’t.I also have the duty of super vision, sometimes called mentoring here, over external co-workers, who create 3D designs for us as well.I check their projects in terms of design and construction, and I’m trying to pass on the experience that I’ve aquired with previous trial and error. It’s often necessary to lead the designers to a reasonable compromise, so that the final product is accurate and usable, whilst meeting the demands of modelers. It also needs to be produced of course, and applicable for said purpose. A classic example can be a seat, which can have precisely scaled down dimensions according to the original size, but it won’t fit the plastic cockpit, into which it should go. The job is interesting and it’s also a combination of two of my hobbies; scalekit modeling and design drawing. The philosophy of construction-design of your department, and related resin and photo-etchedparts has a solid pillar. Isthat so? One of our main goals is to make the use of Brassin accessories an easy job for a modeler. Modelers are often afraid to work with resin parts. In our case, that fear has no basis. We design our accessories so that neither their assembly, nor preparation of the parts, need any special skill. And yet, they bring a whole new level of fine detail, which will improve the look of an already nice looking kit. We’retrying to make our resin parts much more realistic than injection moulding technology affords us, and I don’t mean to vilify the plastic itself.Injection moulding has its limits, and everyone who has even held resin in their hands knows that resin parts will always feel and look better than plastic parts. What can we expect from the Brassin cockpit for the quarterscale Bf 109G-6? The main reason that we made this cockpit has already been discussed here. It will provide better detail in comparison to the plastic parts, although the plastic parts of this kit are also fine in terms of detail. Our approach is similar as with the Spitfire cockpit. There’s a unit consisting the basecockpit tub (in this case also including the sloping bulkhead), sidewalls and front bulkhead.Wherenecessary, we add photo-etched details, in color if possible, such as the instrument panel, oxygen apparatus, sidewall detail etc. What I like with this specific cockpit are the side walls. The Bf109G cockpit was very narrow,so there were no sidepanels, as there was in the Fw190. Instead, various accessories were mounted directly on the inner walls of the fuselage.There was quite a diverse set of devices, such as pipes, cables, chains and rods that make the walls of our Brassin cockpit richly-dressed and good looking. 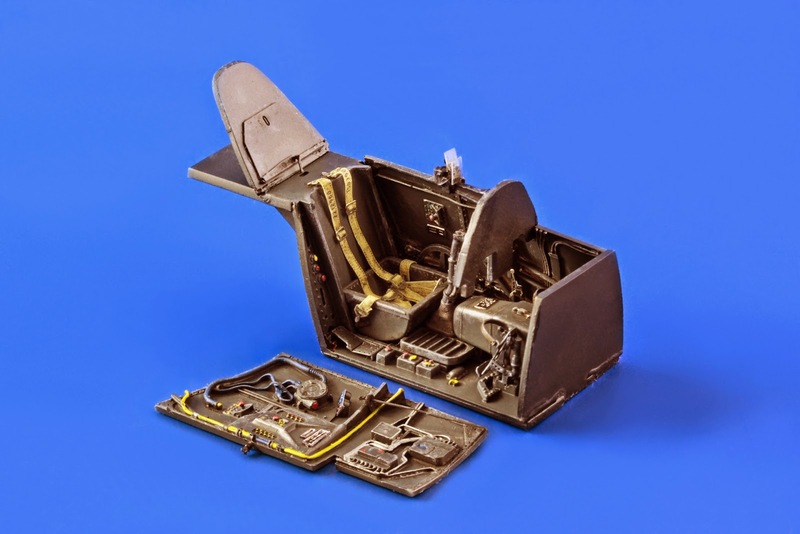 I also like the control stick area, the footrest and the weapon covers, supplied in two versions (MG151/20andMK108).This is what makes the cockpit look busier, in comparison to the BF 109E. The entire assembly has 21parts,and on the top of that, of course, a fret of colored etched parts. Apart from design work, you sometimes face completely different tasks. I suppose, from a marketing point of view, these would also be worth mentioning. 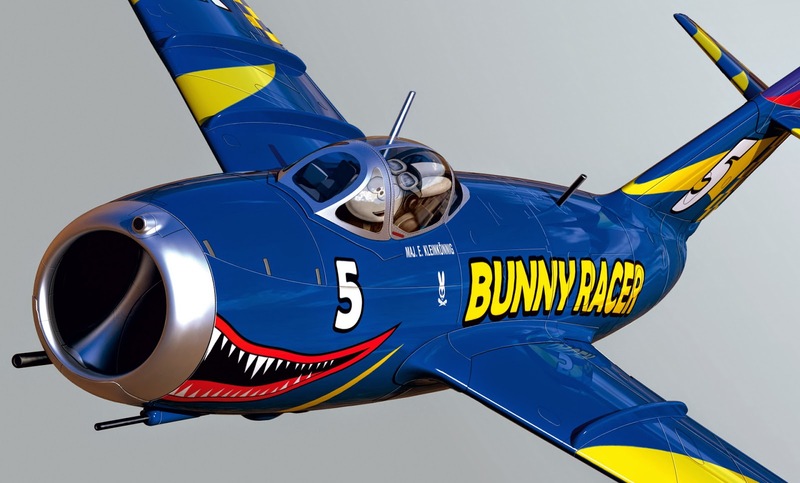 Oh, I see you mean the BunnyRacer? Yes I created the render for the boxart using your colorscheme, which was then forwarded to Katherina Borecká, to finish the panel lines, shadows and reflections. Into the cockpit, she also pasted a very realisticly looking 3D image of our bunny, supplied by Honza Bobek. So this boxart was the result of a pleasant cooperation between 4 people. I was able to capitalize on my previously acquired skills too. I really enjoy this type of work, but unfortunately dont have much spare time for it. Well then, tell me about the P-38? You're right. 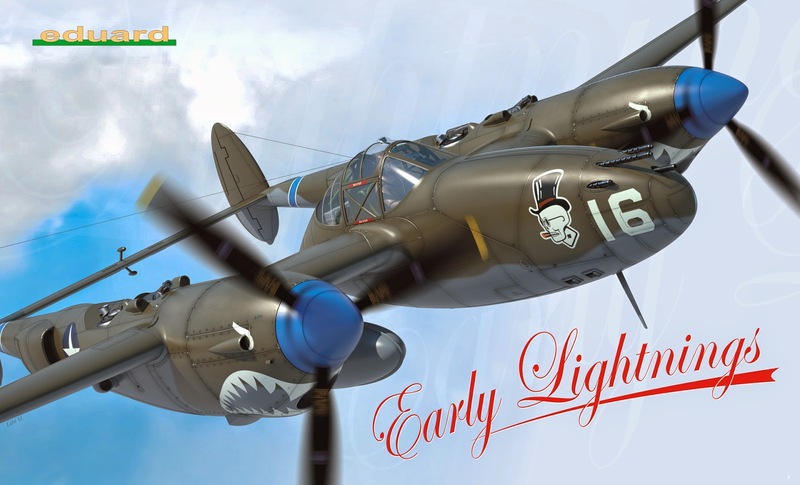 I also drew some “serious” boxarts for our P-38 limited edition kits,for which I also designed the brassin cockpit. Another of my drawings wasthe F-16, for the Top Falcons and NATO Falcons limited edition kits. Included was the Italian F-16 with Diana on the vertical tail. It always has to be a combination of render and subsequent painting work in order to breathe life into the picture. The render of a 3D model has agreat feature that solves perspective, reflection and shadows, but it is necessary to continue working with colors, panel lines and other details to make the final result look good. And a common question. What are you currently working on? 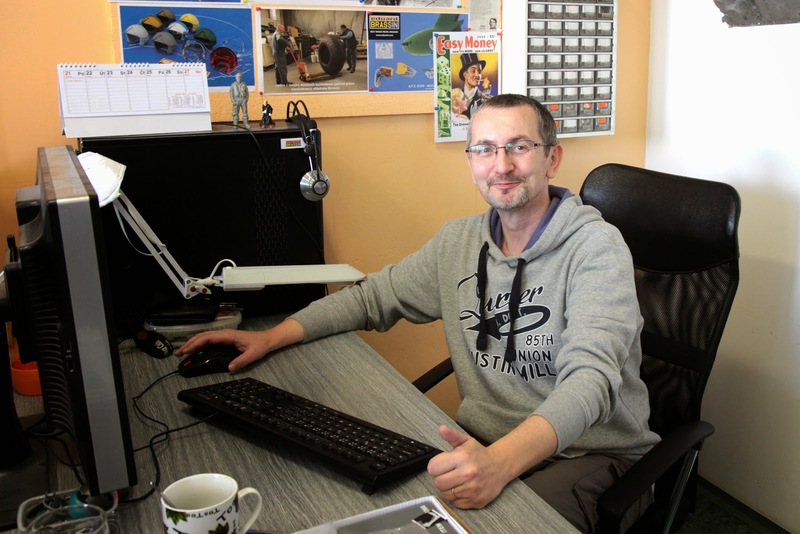 I just finished mentoring for the radio compartmenton our 1/48Bf109G-6, wheels for the Bf109G-10 in 1/48 and 1/32 scales, plus Mk.44 torpedoes in 1/72. At the moment I am working on a seat for the Tomcat, which will also be released within our limited edition range of kits. This should be released in August 2014, and I’m also mentoring our external co-workers who are preparing the wheels and exhaust nozzles.